Textile engineer Mark Sunderland fits Olympic rower Chierika Ukogu for her seamless unisuit and tights. When members of the U.S. Olympic rowing team hit the waters in Rio later this summer, they will be wearing an innovative seamless unisuit developed by performance apparel expert Mark Sunderland, textile engineer and Robert J. Reichlin High-Performance Apparel Chair at Philadelphia University. The unisuits, designed for superior performance, mobility and protection, are the first of their kind in rowing apparel. Sunderland’s collection of rowing apparel for the Olympics, which also includes tights and sports bras, uses leading-edge technology that intimately blends fibers to create a seamless, ultra-lightweight product that fits like a second skin. “The seamless construction and other innovations in the unisuit take it to another level of technology in performance wear,” said Sunderland, citing the suit’s moisture barrier, wicking ability, anti-microbial finish and double-layered bottom construction that enables rowers to forego underwear for more comfort and closer fit. U.S. Olympic rowers will be wearing Sunderland’s innovative seamless sports apparel at the Rio games this summer. In addition to its performance attributes, each seamless unisuit is knitted with an anti-microbial material that will provide an extra layer of protection for the athletes from the contaminated waters of Rio. Moreover, the unisuit is one of the most environmentally friendly pieces of apparel manufactured anywhere, with less than a gram of waste–less than the weight of a piece of paper–for each suit. Top-level apparel performance, mobility and fit are paramount for today’s Olympic athletes, competing in sports where hundredths of a second can make the difference between winning a medal or being left off the podium. That’s why Philadelphia-born Chierika Ukogu also will be wearing Sunderland’s unisuit at the Rio Olympics–while representing Nigeria as its first Olympic rower ever. The 2014 Stanford University graduate, whose parents are Nigerian, has dual citizenship. Her Olympic unisuit will be all green (the Nigerian flag is green and white), while the Americans’ unisuit will have navy blue bottoms and white tops with a USA logo. The road to the Olympics for Sunderland, a 1984 PhilaU graduate who received his M.S. in here in 2005, started about a year ago. As the Robert J. Reichlin High-Performance Apparel Chair, he received a five-year, $100,000 award–the largest amount donated for a chair at PhilaU–which he used for research and development of the seamless rowing apparel. Ukogu will be representing Nigeria as its first Olympic rower ever. The development process included much trial and error to find the right combination of materials, knitting, engineering and design. Sunderland, a leading expert in high-performance athletic apparel with more than 30 years of experience in engineered advanced textile materials and products, said there were times he thought he had the correct fabric recipe, but the finish wouldn’t adhere properly and he had to go back to the drawing board. In addition to its seamless innovation, the water-repellent unisuit provides athletes with increased mobility from power-stretch panels knitted at strategic locations. It also addresses the issue of heat by wicking the athletes’ sweat from inside the suit and venting their body heat through the power-mesh panels, which are designed both for aesthetics and performance. 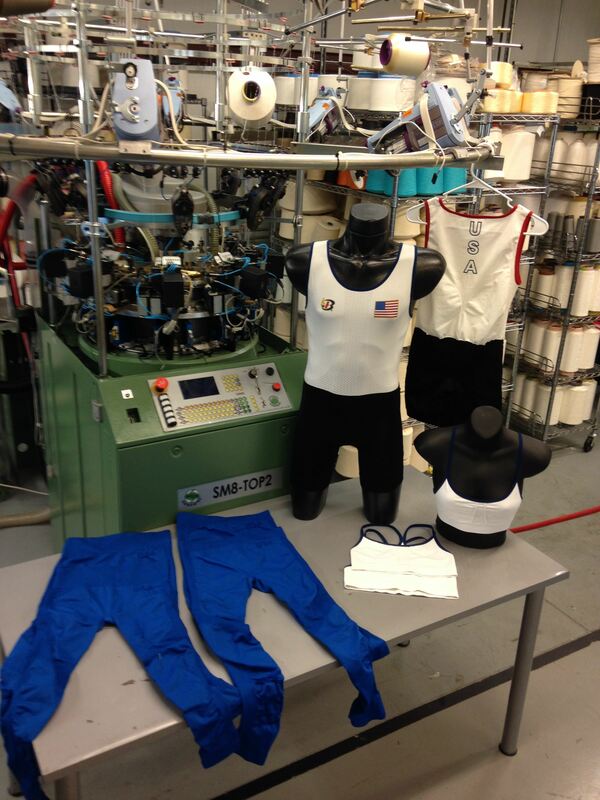 To bring the unisuit to market in time for the Aug. 5-21 Olympic games, Sunderland partnered with Boathouse Sports, a world leader in rowing apparel whose president John Strotbeck was an Olympic rower. Sunderland is continuing to work with the firm to bring the innovative technology to wider commercialization. Read more about Mark Sunderland’s innovative rowing apparel in The Philadelphia Inquirer.